During the twelve months that ended in late June, Apple reached an important milestone. It was the first 12-month period in which the company's reported revenue exceeded $100 billion. Apple's fiscal year ends in late September, but the trends revealed in the four fiscal quarters that ended in late June provide important insights into the company's current rates of revenue growth and the dynamic nature of Apple's revenue mix. In the four fiscal quarters ended in late June, the company reported revenue of $100.322 billion, a year-over-year increase of 75.73%. In this four-quarter period the Apple iPhone and the Apple iPad represented 60.98% of revenue and 88% of the $43.233 in revenue growth over the corresponding prior year four-quarter period. 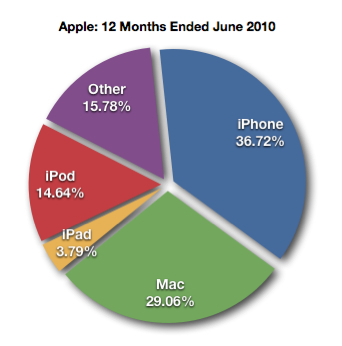 The iPad's sales presence in all four quarters of this twelve-month period significantly boosted revenue growth. However, iPhone revenue growth of $23.936 billion exceeded total iPad revenue of $16.282 billion during the four fiscal quarters. The iPhone's particularly strong June quarter performance was due in part to Apple's decision to handle this year's iPhone transition on a different timetable than in the past. The iPhone remains Apple's flagship product and is the primary catalyst for Apple's frenetic rates of revenue growth. Apple's decision to push the transition to the iPhone 5 well beyond the start of the September quarter has merit provided sufficient product supplies are available at the time of the product's release. The graph and table data below illustrate and delineate the sources of revenue in this four-quarter period that fueled the 75.73% rate of revenue growth and the revenue total that topped $100 billion. Although the Macintosh line of personal computers achieved an impressive 22.86% gain in revenue, the Mac's contribution to overall revenue fell about 30% from 29.06% of reported revenue in the prior 12-month period to 20.32% of reported revenue in the 12-month period ended in June. The Mac line's $20.381 revenue total during this period, however, should not be overlooked even if the results are overshadowed by the revenue growth performances of the Apple iPhone and Apple iPad. It's no secret in smartphone era there's less need for specific-use digital music players. Although iPod revenue continues to decline, the iOS-based iPod touch, which represents over 50% of the iPod line's revenue, continues to succeed. In Apple's FY 2012, beginning in late September, the entire iPod line will represent less than 5% of the company's revenue total. The revenue from the specific-use digital music players in the iPod line has become virtually inconsequential to results. Apple's first 12-month period that generated revenue above $100 billion passed unceremoniously and without attention due to the fiscal year cycle that ends in late September. In the current quarter and through the next fiscal year, more than two-thirds of Apple's revenue will be generated by the iPhone and the iPad, two products that were introduced to the market within the past five years. Apple's dynamic revenue mix is exemplified by the rise and fall of the Apple iPod line. 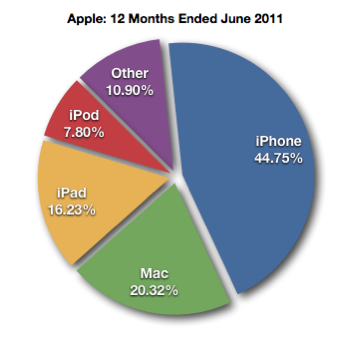 As recently as five years ago the iPod line was Apple's biggest revenue contributor. Next fiscal year it will represent less than 5 percent of Apple's revenue total. The successful launch of the iPhone 5 in the coming weeks will determine whether or not Apple's 75% rate of revenue growth over the last twelve months will continue through the end of this fiscal year and the holiday quarter approaching quickly on the calendar. Charted below for comparison is Apple's revenue mix for the 12-month period that ended in June 2010. Where In The World Is Apple's Growth?